my non-heatstroke was totally worth it. all that cooking last night was totally worth it. In honor of stacey’s cooking blog devoted to world vegetarian by Madhur Jaffrey and also my northern neighbor and friend who’s been cooking from it a lot lately, I requested the book from the library and it is AMAZING. it should be required reading for all csa members. it is about 4 inches thick and includes all kinds of vegetables and best of all, it’s indexed really really well. I’m absolutely going to buy a copy of my own. which is not only one of the best tasting but the easiest eggplant recepes I’ve ever made. I’m pretty scared of eggplant because it can be so bitter, but this was brilliant! It was good after I made it and it was even better today at lunch. I might eat it again for dinner. Supertasty. ok, so maybe I do get some street cred for not having A/C. It’s awfully hot out there. it’s not hot, say, when you walk out of your office building and go sit in the sun for a few minutes until the heat sinks into your bones. 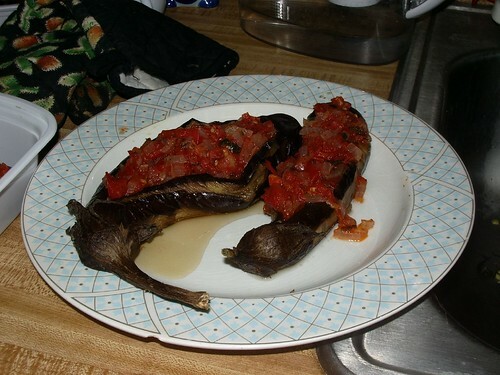 It’s hot when you go home, bake eggplant for an hour while simmering a tomato filling to stuff in them, wash dishes in warm water, and then go to the gym for a run before heading home to sleep spread-eagled on the bed in as few clothings as possible with a fan pointed directly on you. to my credit, I will say that I am pretty good at managing the hot apartment schemes – between closing the shades when I leave in the morning, opening them at night, and blowing night air into the apartment starting as soon as I get home, at least my apartment isn’t any warmer than the out-of-doors. and Man I love ice water. it is the best. I spoke to my brother last night who DOES work outside, and he said at least he’s working outside and not inside hot sticky close electrical rooms like some of the guys. I still need to touch base with my mom and make sure that she’s doing her best to weed only under trees and near fountains. For that matter, there MUST be some fountains that need inspection, don’t you think?